Piggy + Bear Essentials have hit this one out of the park and into the home! EVA soft foam giant jigsaw pieces are great fun and perfect for the play room, nursery and stylish enough for the lounge. The pieces are all the same size (30cmx30cmx1.4cm) and the 16 piece pack fits together to create 1.2mx1.2m floor area with finished borders and corners. 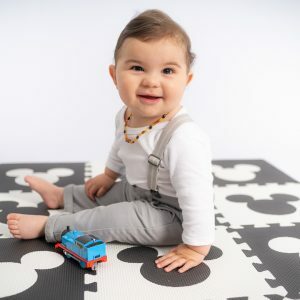 Available in Stars and Mickey, the floor mats are quick to lay, easy to store and are made from a high quality, closed cell (non-absorbing) EVA foam which is 100% non-toxic and latex free!